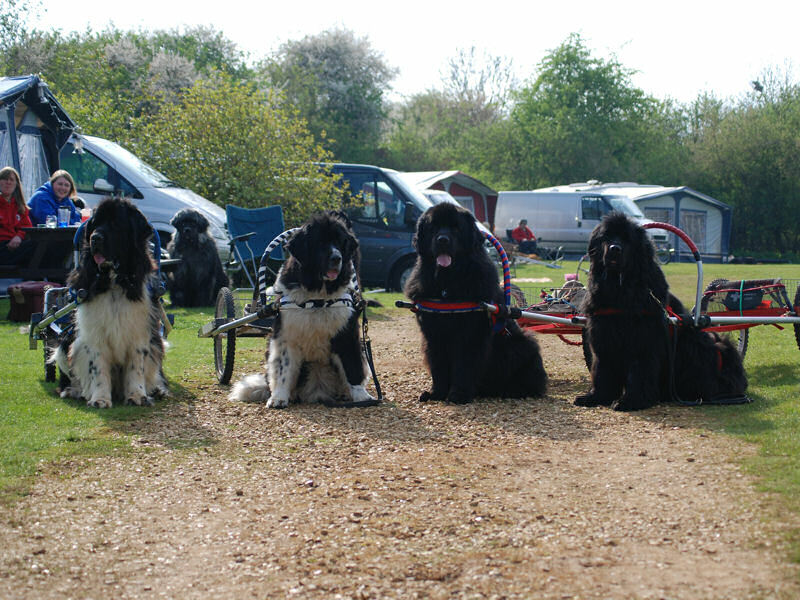 Deifen, Murphy, Yogi & Willow who all achieved Level 4 passes! 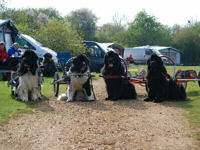 This year we were in a dedicated area on the other side of the caravan park which worked very well. Everyone was able to watch the control sections from the comfort of their caravan and there were no distractions from members of the public and their dogs. We were also next to the dog field which was very convenient. Saturday started cold and windy but the weather improved and was sunny and warm in the afternoon. Due to the high number of entries in Levels 1 & 2 it was a late start and finish for Level 4. The number of entrants through to the hauls also caused a problem with the loads available. This was solved by Level 2 judges agreeing to run 2 hauls. Maybe this could be prevented by entrants providing their own loads � it is easier for each entrant to transport a maximum of 4 water carriers than for the test manager to supply 40 plus! Many thanks to entrants and judges for their understanding and co-operation. Sunday was bright and sunny � ideal carting weather. Fewer entries in Levels 1 & 2 today but a large entry for Level 3. 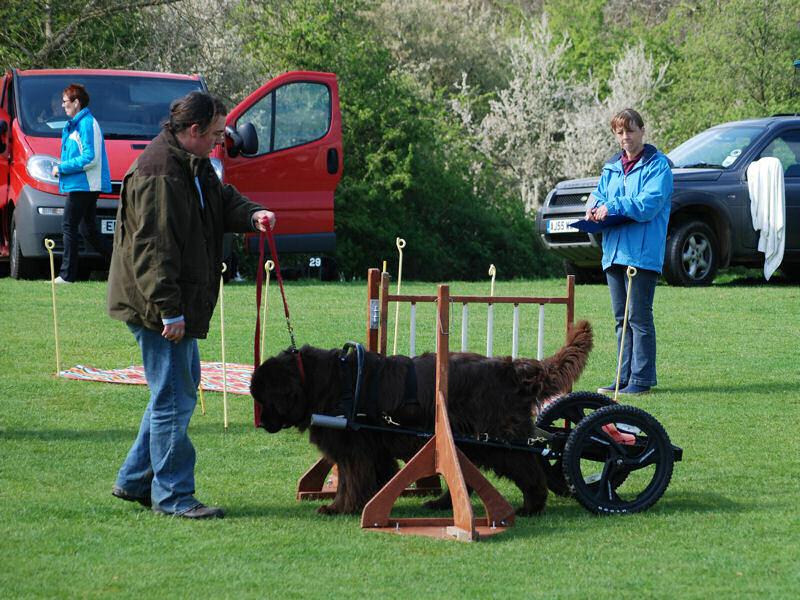 It was lovely to see the junior handlers working so expertly and all the golden oldies having a great time. Congratulations to those who achieved their multi passes this weekend. Many thanks to all the judges, call stewards and haul stewards and especially the tea lady with her crutches! Most importantly, many thanks to all the entrants who made this a fun filled and enjoyable weekend. Constable�s Culnor Be Cool "Daisy"
Spence's Lonesome Pine Great Guns"Yogi"
Yiend's Cherapippin Undersilk Wood "Leila"
Hewson's Shalowseas Sterling Silver "Sterling"
Baugh's Cumngo New Century Dawns over Bearhugs "Robbie"
Bash's Lonesome Pine Love Em An Weep "Baccardi"
"Bo Peep is a very dog friendly caravan site and an excellent venue for Draught Tests. It was an excellent weekend with a high number of entries in all levels. There were 14 entries in level 1 of which 13 passed. 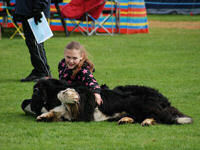 It was great to see entrants of all ages, dogs and handlers, taking part at this level. 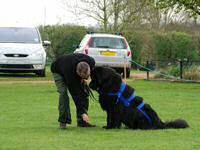 The overall quality was good with handlers actively encouraging some dogs and making good use of verbal commands. There was the normal unnecessary use of the lead particularly when turning or stopping. When the call steward states the direction the handler needs to command the dog and then complete the manoeuvre as opposed to changing the direction without commanding the dog. The criterion for the down stay element of Level 1 has become very lapse over the years. In the past you had to leave your dog in the down stay and take at least two paces away. 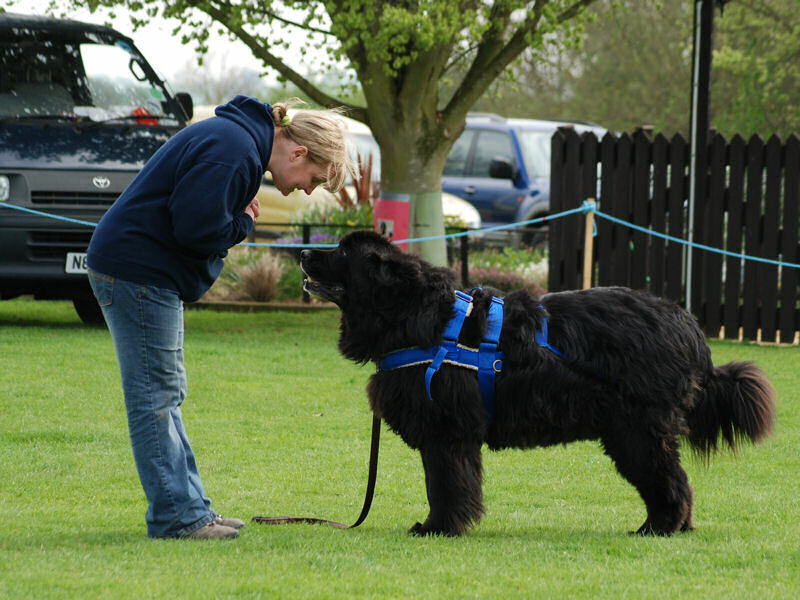 There was no option to sit with your dog, reinforcing commands throughout the exercise and I remember failing in the early 1990s due to my dog breaking the down stay. The new regulations will hopefully clarify the situation and be more explicit regarding this element of Level 1. Overall the quality of the control sections was good with all seemingly enjoying themselves. Thank you to our call steward Ben Mercer and to all those who helped make the weekend so successful." "13 dogs for Level 1 today. The weather improved as the day went on. A good standard by all dogs and a few first time 'draughters'. Two veteran passes which are always a delight to see. Only one 'not ready' today, a little more work needed on the down-stay. 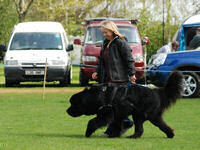 Thankyou to a 'super-efficient' Ben, the Call Steward, also fellow judge Kevin and to Horsham Newfs for their hospitality." Baugh's Stelamah Sealed With A Kiss "Evie"
There were 11 entries in level 2 of which 8 passed. It was great to see handlers actively encouraging their dogs in the control section, which meant that the majority completed this element to a high standard. A number of the entrants need to work on change of pace before moving to the next level. The majority of points lost and those who were unsuccessful on this occasion were due to breaking the down stay, which also will need work before moving to the next level. 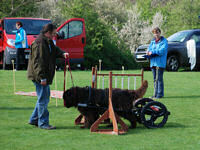 There were 8 dogs that went through to the pull section which was completed in two groups of 4. One entrant really must pay more attention to the cart especially when tackling obstacles. This feedback seemed to have been ignored given their performance on the following day. Overall, the pull sections were excellent with teams thinking about the obstacles and using stewards where appropriate. The majority of teams worked well together exhibiting a calm and steady approach. Well done to all those who passed. "Firstly I would like to thank the Southern Newfoundland club for asking me to judge at their tests. I would also like to thank Kevin Mercer for allowing me to judge alongside him, and Angie Mercer for a lovely and smoothly run event. 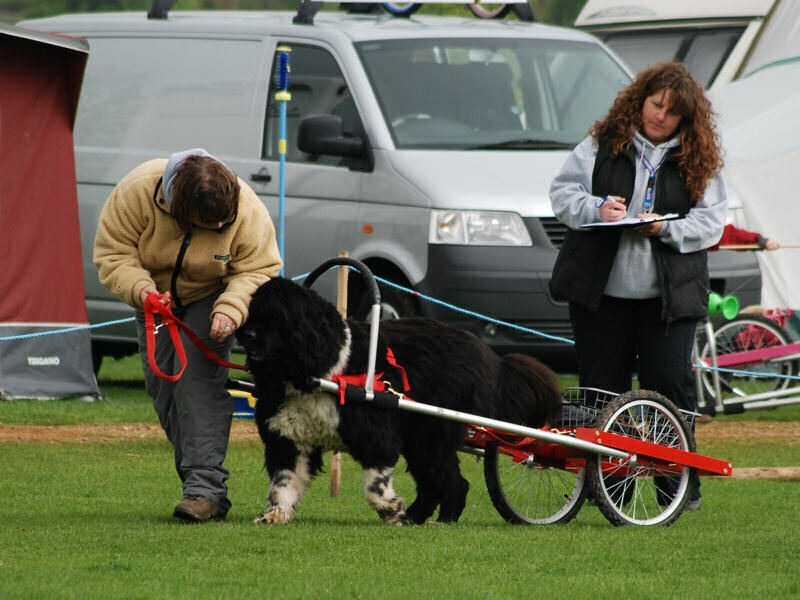 I would also like to thank the participants for giving me the opportunity to judge our wonderful dogs. 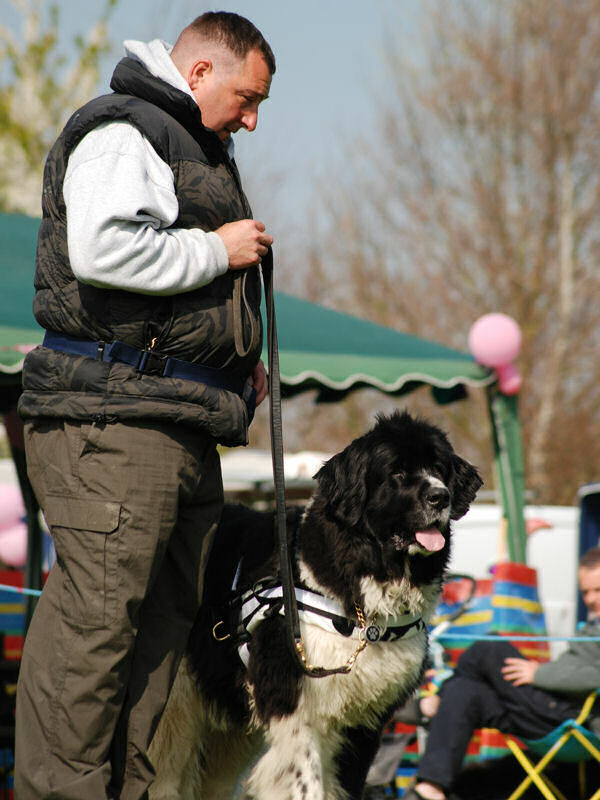 We had a great entry of dogs and handlers. 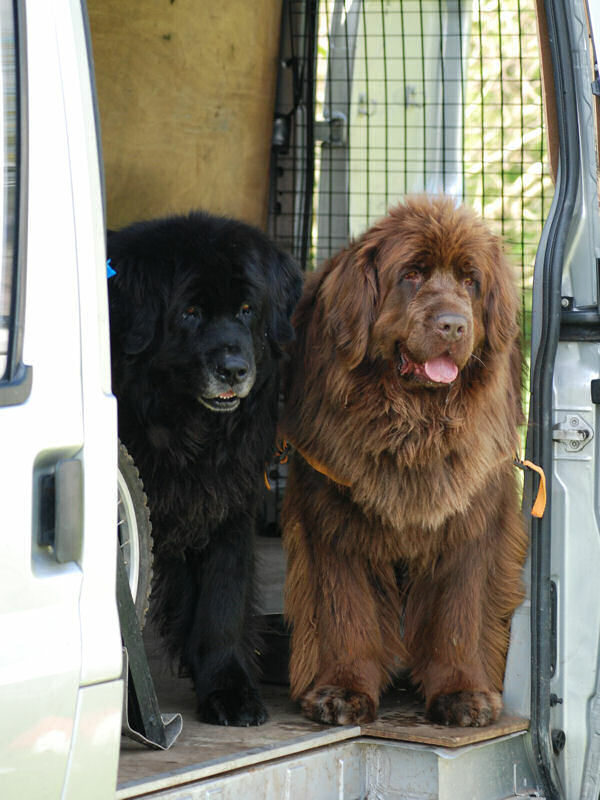 There were handlers of all experience and to some degree you could tell the experienced ones. However there were some very good novice handlers and one in particular I would not have known was a novice, this team was very good on manoeuvres and should go on to do very well as a team. We also had one very stubborn young lady and her handler did a great job to keep her going. This is very difficult under test, you never know when to give up or persevere, well done to this team. Overall the standard was very good. 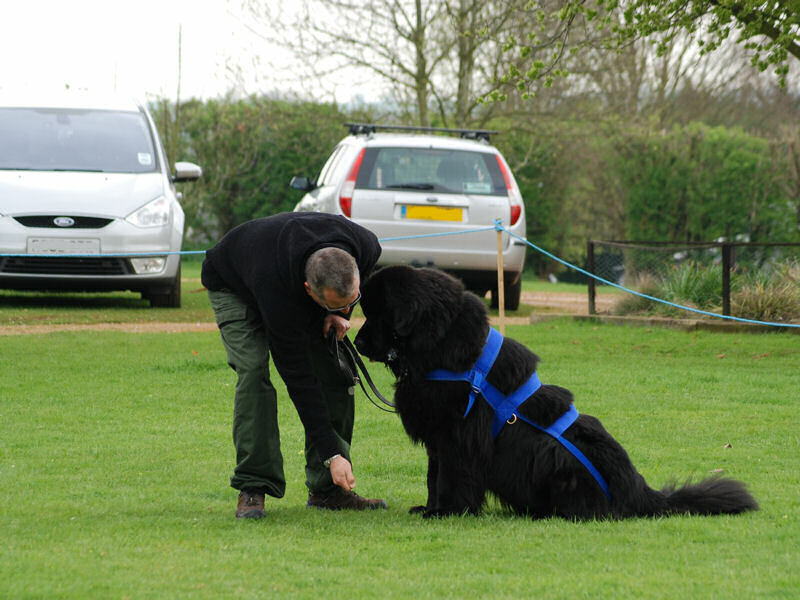 I was impressed especially with the handlers confidence in their dogs waiting for gates to be opened and closed etc and not needing to use a steward to hold the dog. Some of the teams just need a little more practice on tight moves i.e. just taking it a little bit slower and thinking about it first, there is no time limit and it is not a race so if necessary take it slow. The biggest problem was the dreaded down stay. The teams that did not make the haul only lost out on this element because all of the control sections were acceptable. Bad luck to these teams, that's Newfie's for you. They can do it a hundred times in training and goof it up on the day, that's why we love them so much. Thanks again for allowing me to judge and well done to everyone." 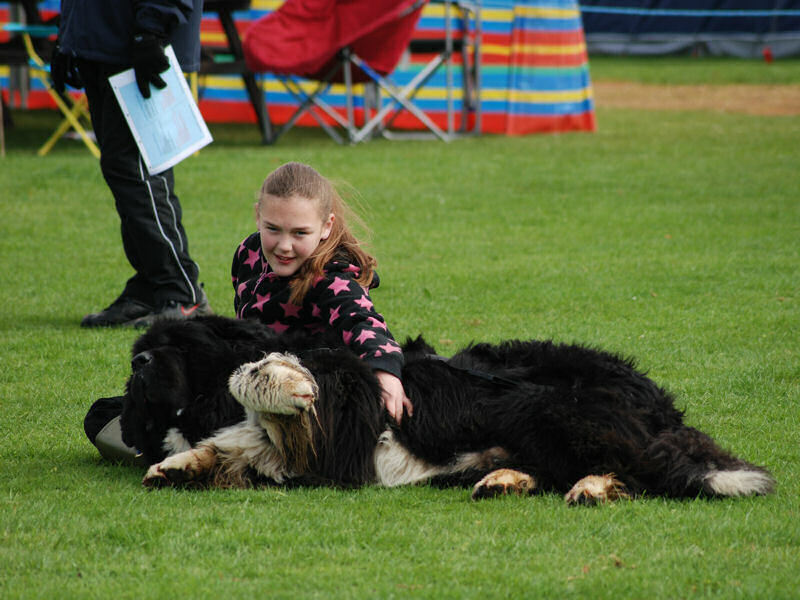 Constable�s Hanningfield Water Willow "Willow"
"Nice to be back at Bo-Peep judging Level 4. 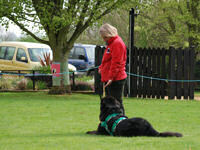 We had four entrants and all teams worked very well together, showing good communication between handlers and dogs. The only thing to comment on is the change of pace. A couple of teams lost concentration for a time, otherwise everyone worked to a very good standard. 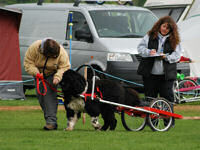 All teams worked together on the haul and encouraged each other and their dogs which was good to see. All had well deserved passes. We enjoyed our entrants good humour and banter. Thankyou one and all for a lovely afternoon. Thankyou also to the Test Manager and Call Steward." Hewsons� Paradeso Silver Dollar "Dollar"
"First I would like to say thanks to my fellow judge Rachel and our call steward Rob who did a splendid job of giving clear instructions to all the entrants. I would liike to say well done to everyone who entered whether you passed or not. To those who aren't quite ready, practise I am sure will bring passes in the future. To those who did succeed, well done, you were a joy to judge, especially the golden oldies who are still having fun doing their draught work." "Disappointing low entries but a lot of people had entered this level on a previous day. 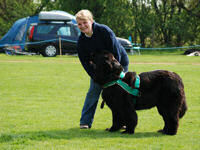 Fabulous junior handler who handled two very large dogs very well and shows a lot of promise for future events. Only one team 'not ready' as it was their first attempt, but a valiant effort under the watchful eyes of his supporting group." Baugh's Nutbrook The Butty Alice "Alice"
MacKillcan's Mileoak Whispered Secret "Daisy"
"Entry of five teams, all but young Ben with Loxley worked well enough to pass control section. Loxley spent most of his time with nose on floor. 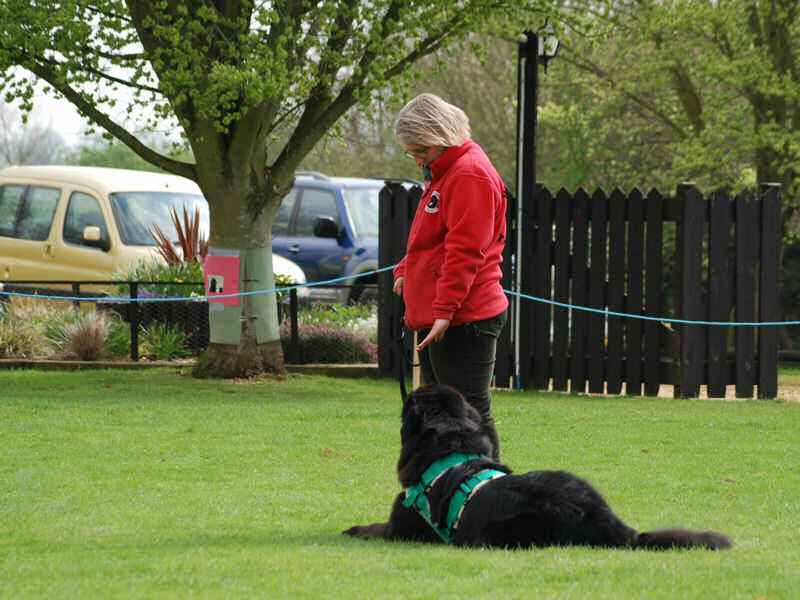 A few tight leads and one thing that we should all look at doing is walking in straight lines with the dog, as it makes it difficult for Call Stewards keeping to the course. No real problems on the haul but this was a very tame Level two for one of the judges. Rachael was a very good and demanding co�judge. Thanks Angie for organising test and cups of tea. A good day had by all, thanks." "Five entries who gave their all which made it a very enjoyable test to judge. All the handlers were in good spirits and the dogs all felt the good energy. Sadly one decided that his nose could not be detached from the ground at any cost despite exhaustive efforts from the handler. 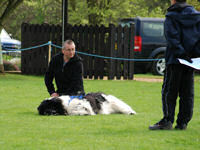 When he switched on for a while he was brilliant, so obviously just a bad day for him but a valiant effort by the handler. Everyone worked very well and were a joy to judge." Dobson's Noddstrickle Albany Surf at Ursanigra "Ginny"
"A good strong entry of ten experienced dogs. Some outstanding control sections with just two failures on back-ups. Other entrants sailed through with minimum loss of marks. Downstays proved to be a bit of a problem for three leaving five for the haul. A lovely haul in perfect conditions with just one loss on the out of sight downstay resulting in four eventual passes."